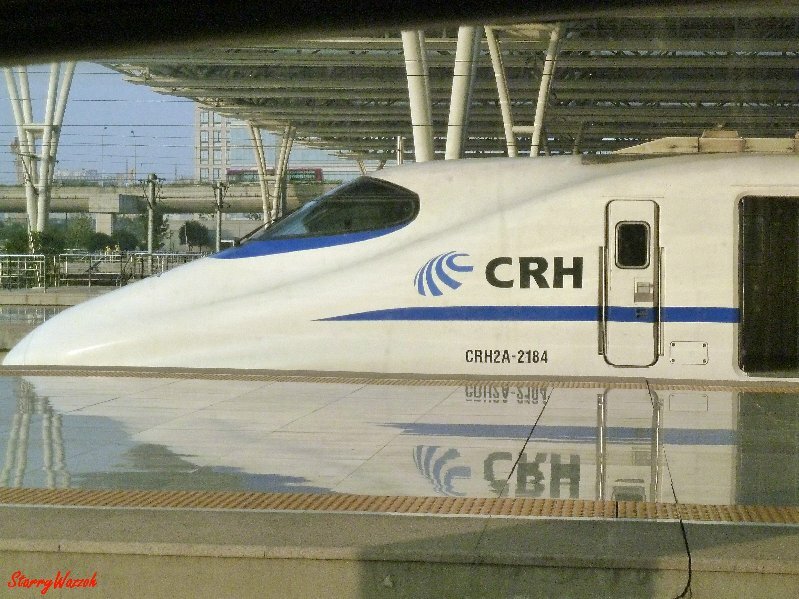 Today (Tues 16 Dec 2014), following our visit to Shanghai and Lianyungang, is the day we embark on our first journey on China’s Bullet Train on the high speed network introduced in 2007. We were not to be disappointed. It is amazing! We had no idea what to expect. Was Chinese Rail ultra modern or still decades behind? We soon found out! We had decided to buy the most expensive tickets on each rail leg of our journey and no regrets about that! We could have taken any seats, even the lowest cost, and we would have been happy enough. But what a pleasure it turned out to be! The location of Shanghai Hongqiao Train Station is in the same complex as the airport and our overnight (Air China) hotel. Very convenient! Its quite a long walk from the hotel to the station but all under cover, protected from the environment. The station itself is huge and very modern. We quickly and easily passed through security and a short queue at the ticket counter held us up for only 15 minutes. This will take longer later in the day probably when more travelers are about – we were there shortly after the station opened at 6 a.m.
Our reservation agent, China Highlights, gave us lots of information about what to expect and how to do everything. We booked early, long before China Rail was ready to accept our reservations. China Highlights handled that and let us know when the reservations had been accepted – all electronically in English. Our reservation printouts and passports gained us our paper tickets within seconds, as promised by China Highlights. The ticket lady spoke not a word to us – just a small smile as she handed over our tickets. It was so easy. We had allowed plenty of time as this was our first experience of rail travel in China. This allowed us time to find breakfast. Only Chinese food (and Starbucks) available but with plenty of restaurants and fast food places, there is a huge choice. All signs are in Chinese and English so it was easy to find our way around. 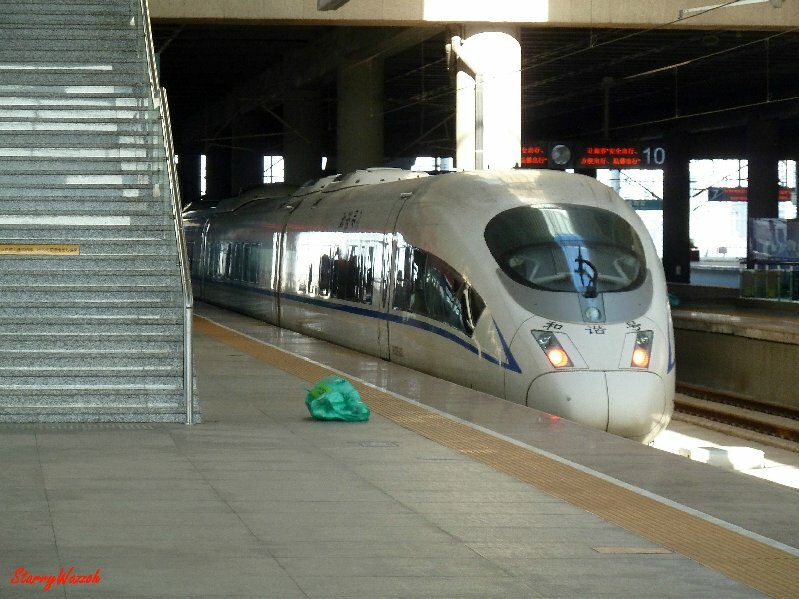 The Shanghai – Beijing train itself is excellent, clean and crisp. Our over-the-top precaution of booking the highest cost tickets saw us in what is called business class. This is actually better than first class with oceans of room and comfortable lie-flat seat/beds; the best I have ever experienced. I would do exactly the same again, regardless of the higher (but not extortionate) cost, simply for the pleasure it gave. 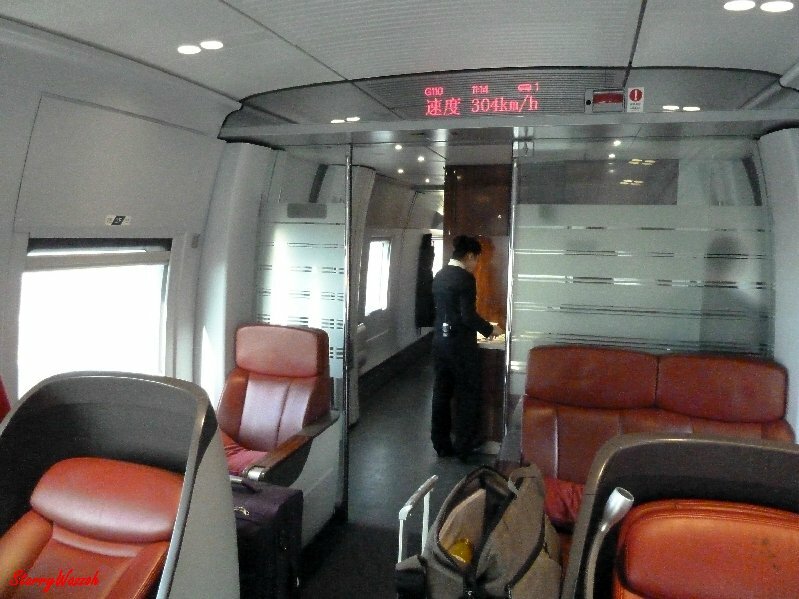 Business Class accommodation on Shanghai – Beijing Bullet train. 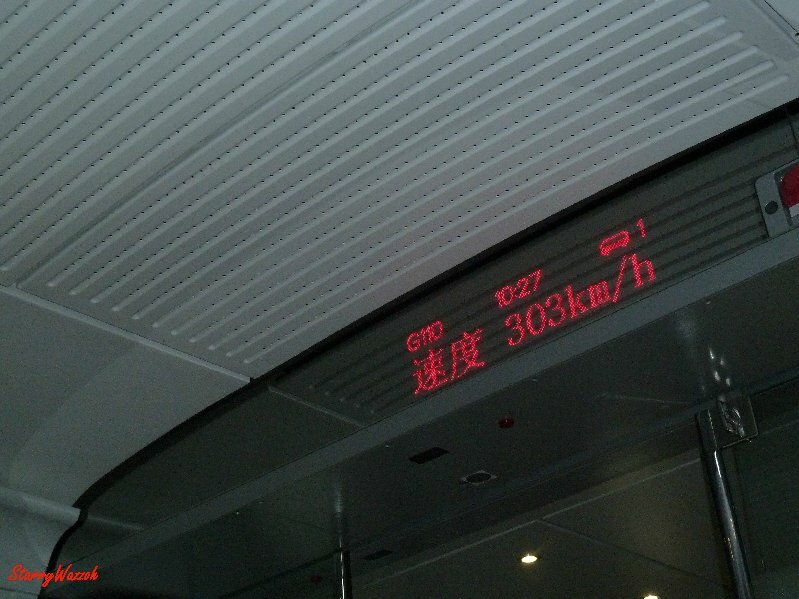 The journey to Jinan West train station from Shanghai is 5 hours at speeds of up to 304km. All stations along the route are modern and well signposted in Chinese and English. The announcements are also all in Chinese and English too. No swaying, no bumping over rail joints! Sheer speed! What a pleasant journey! Our business partners from Zhangqiu met us at the station and transferred us to their factory, an hour’s drive from the station. We stopped for lunch at a rustic country restaurant. Excellent food of course, and enough to feed an army. We transferred to our hotel late afternoon and declined more food, preferring after a long day to to enjoy a quiet even meal a our hotel. This entry was posted in China and tagged Bullet Train, Jinan, Shanghai, Travelogue. Bookmark the permalink. That train looks like fun… But despite having been to China about 2-3 times since the bullet train became active, I still haven’t ridden it. Hi, thanks for stopping by. Yes, it is worth it for the experience alone, but in future I will try to use it in preference to flying in China. Longer travel but less waiting time! And you get to see the country too! Really enjoyed it. HI, I travel on the high-speed trains often and have had the pleasure of being in ‘business class’ occasionally – sheer luxury! the cut the time travelling by a third at least! when you take into account the endless waits at airports, flight delays caused to air traffic congestion – too many planes – the fast train can often actually be quicker! I prefer now to travel by fast train because i can’t stand waiting for hours in airports…..
trains have changed a lot! Definitely! We are on the same page. PS – can’t believe you have been to Lianyunguan – most people haven’t even heard of it! I’ve been twice in the last year and I like it there. Nice people. I hope to spend more time there next visit, later this year. Last times were in winter. I would like to see it in summer. like you said in your post- you can still see nature. we drove around a bit and it was so great to not be driving through endless housing developments and high rise. I think Lianyunguan is the East Coast of China’s best kept secret! hope you get there in summer.